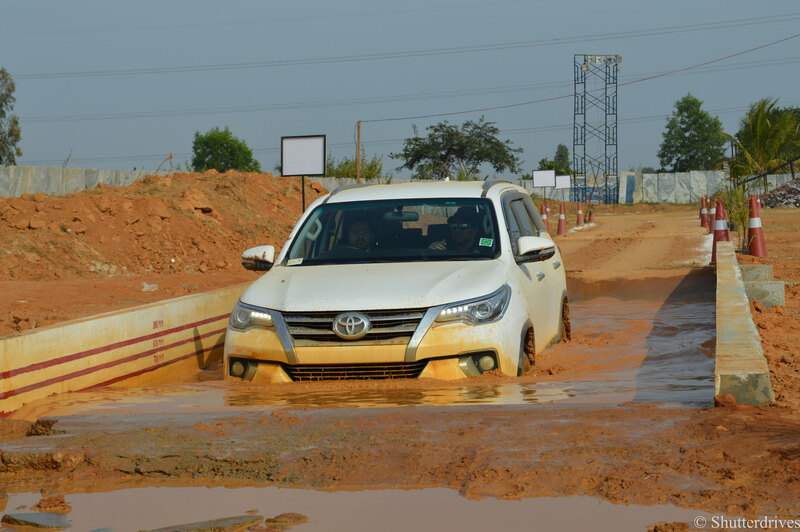 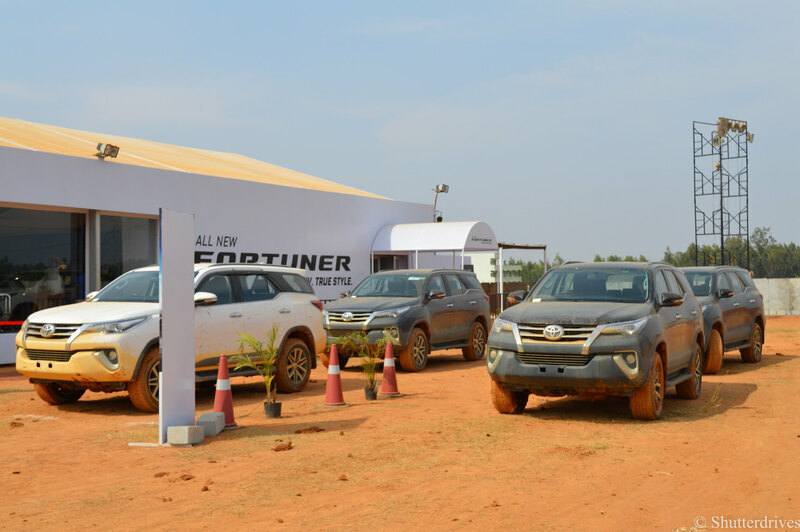 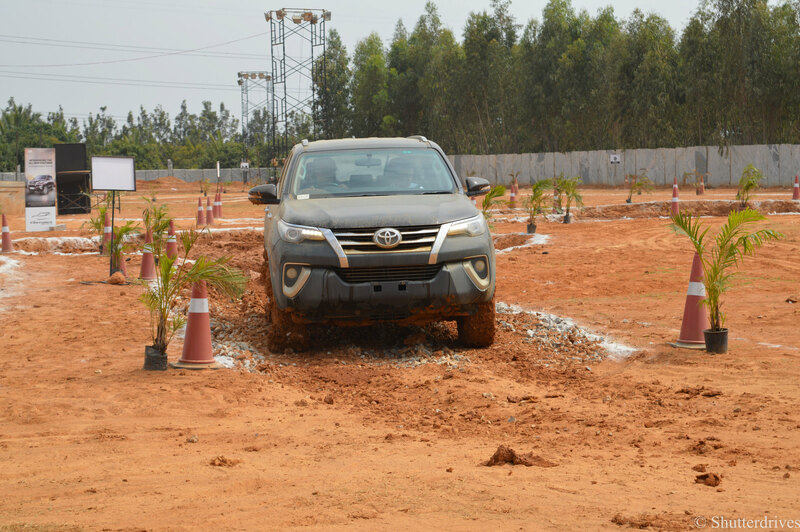 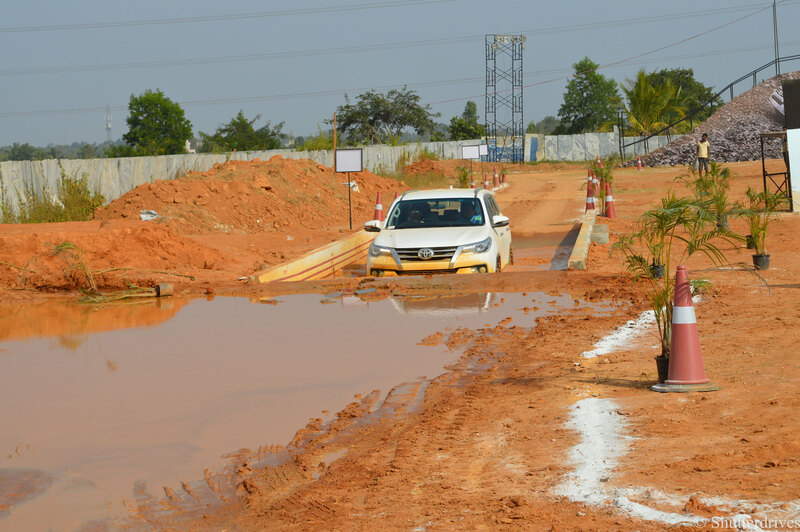 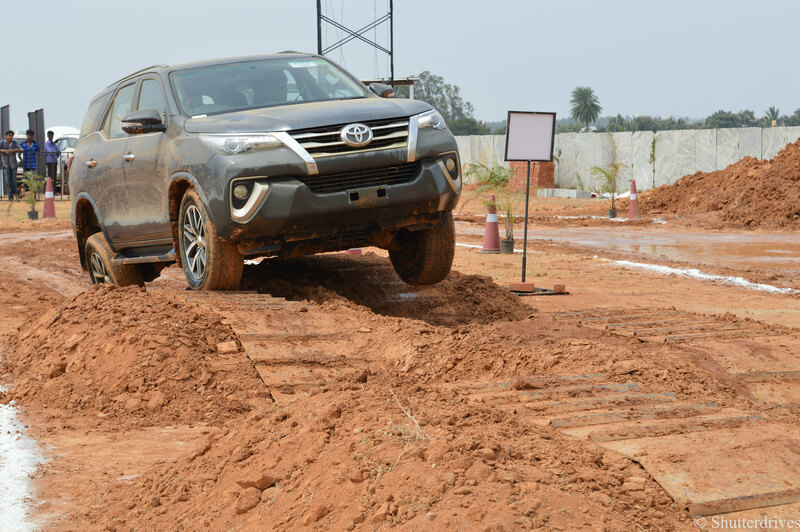 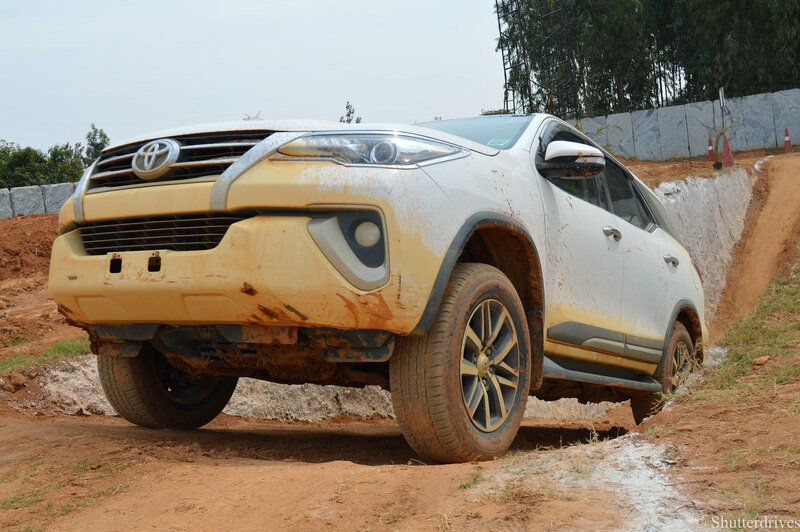 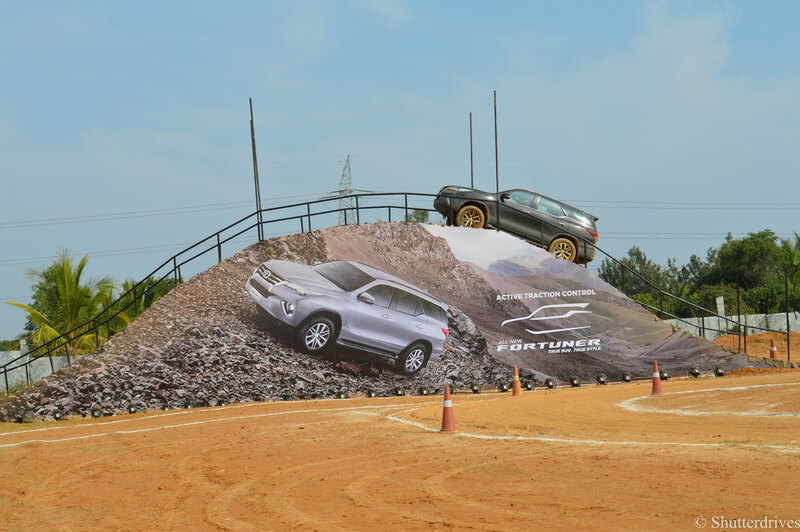 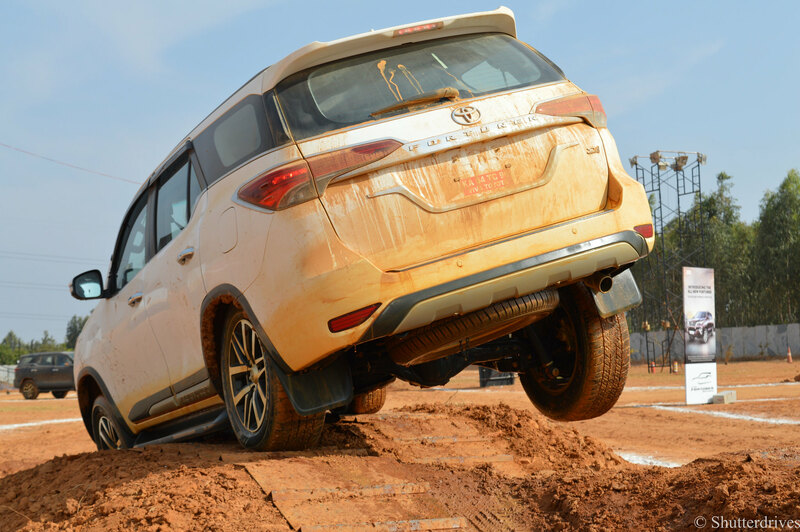 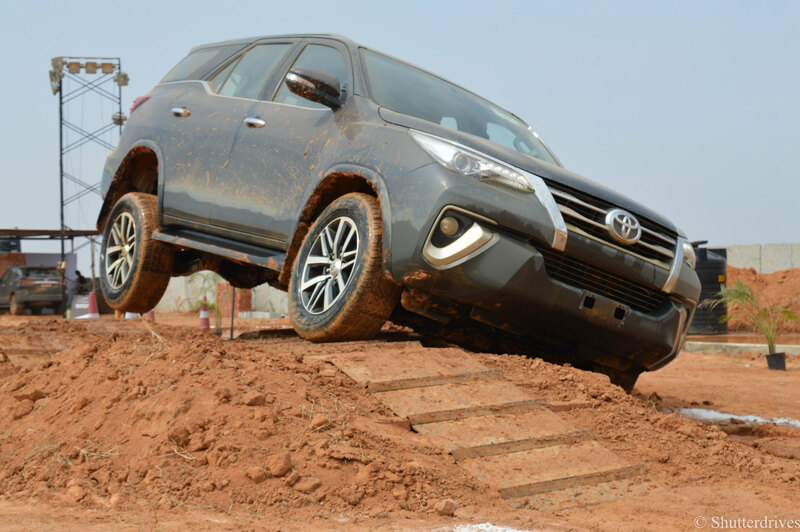 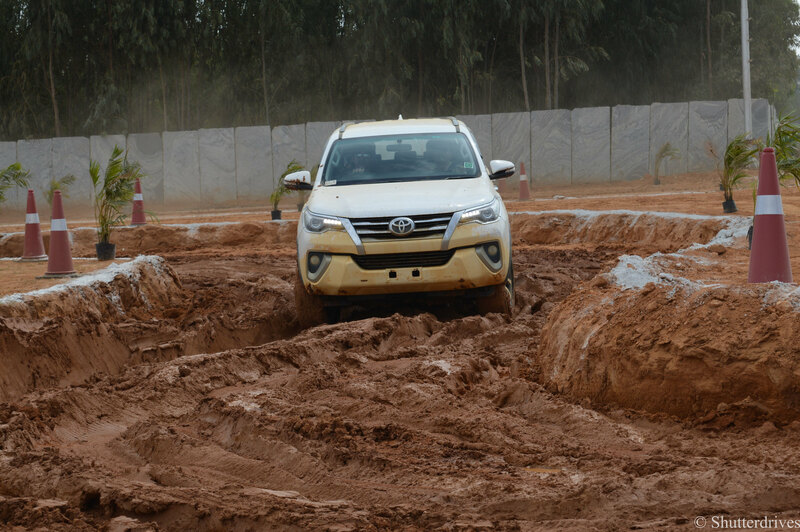 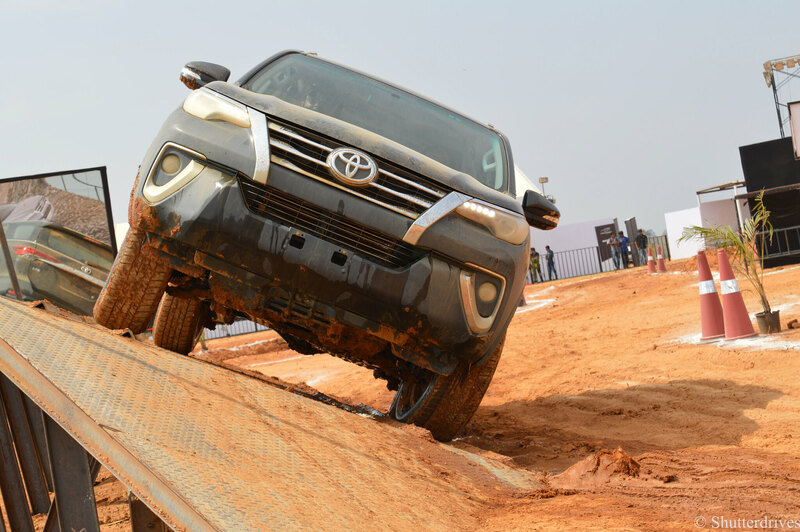 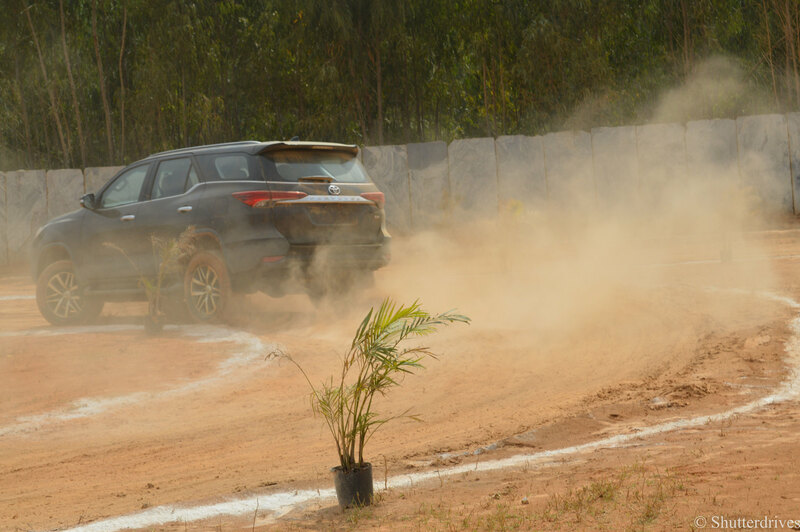 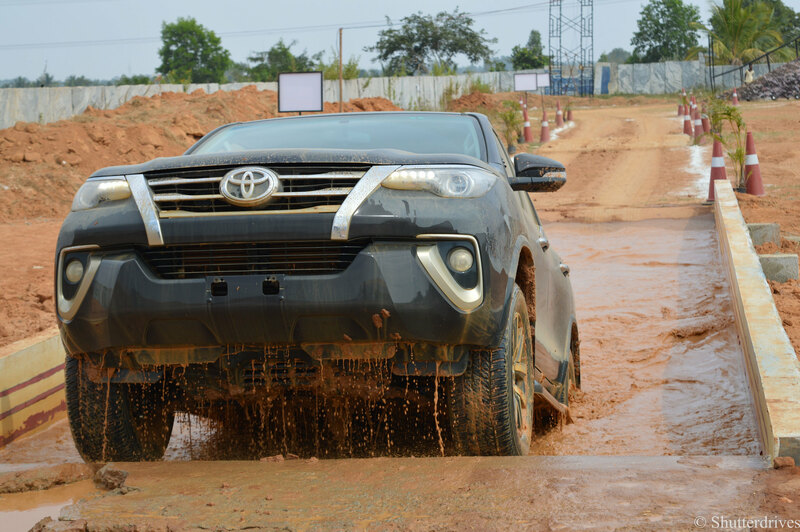 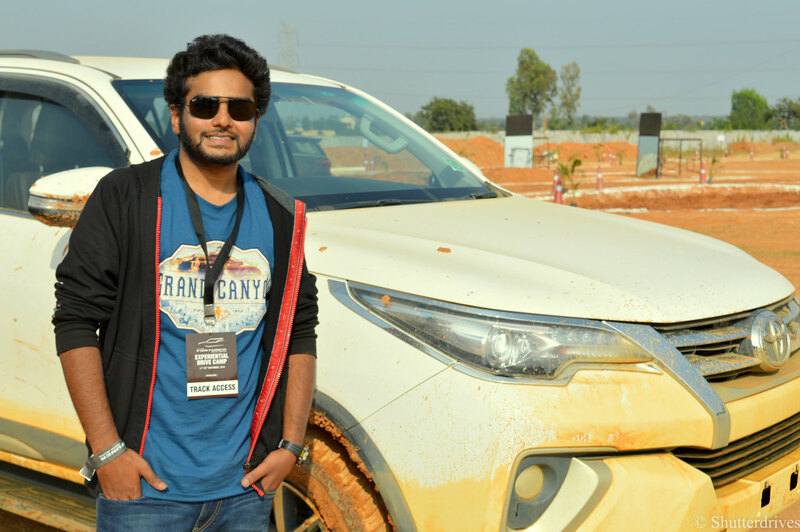 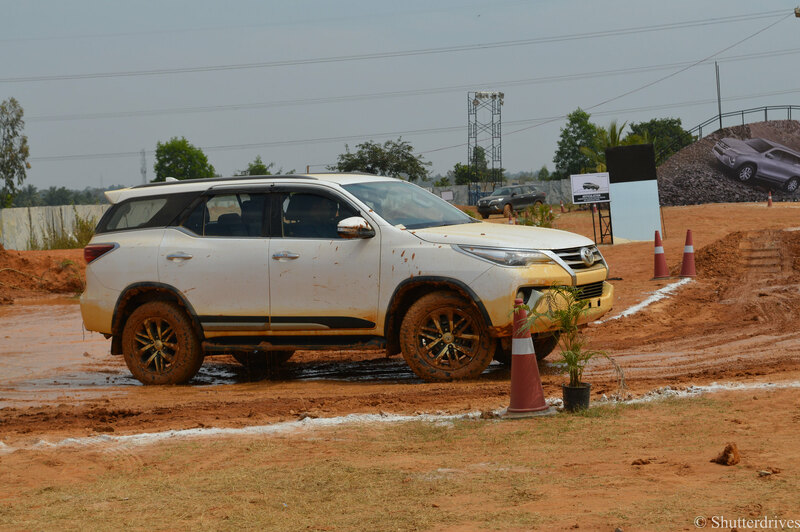 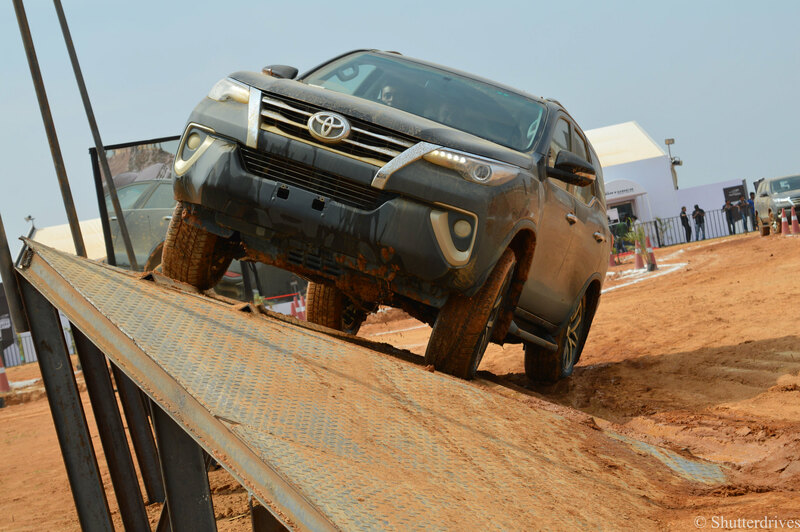 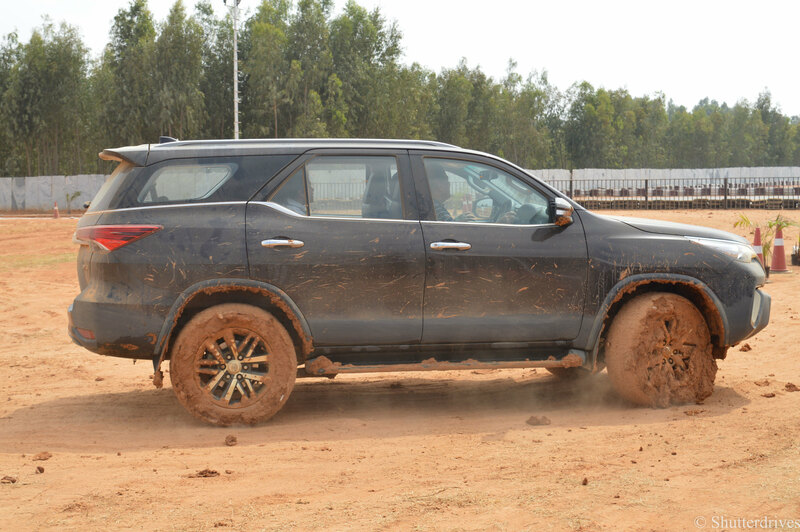 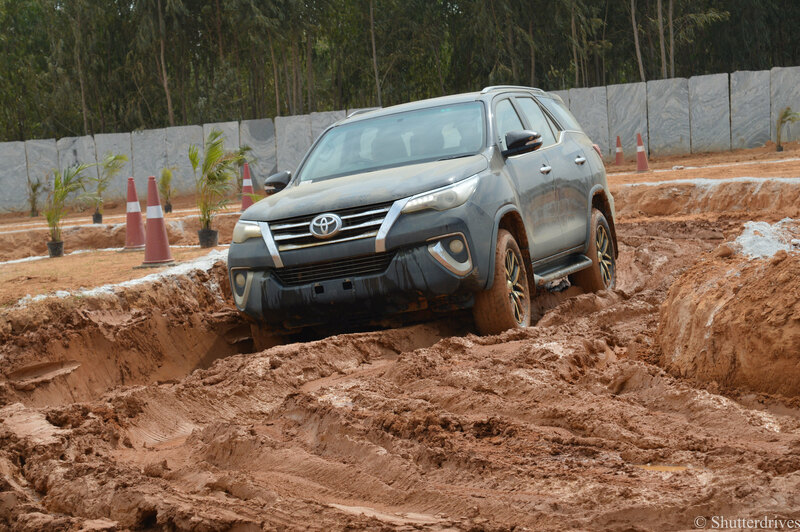 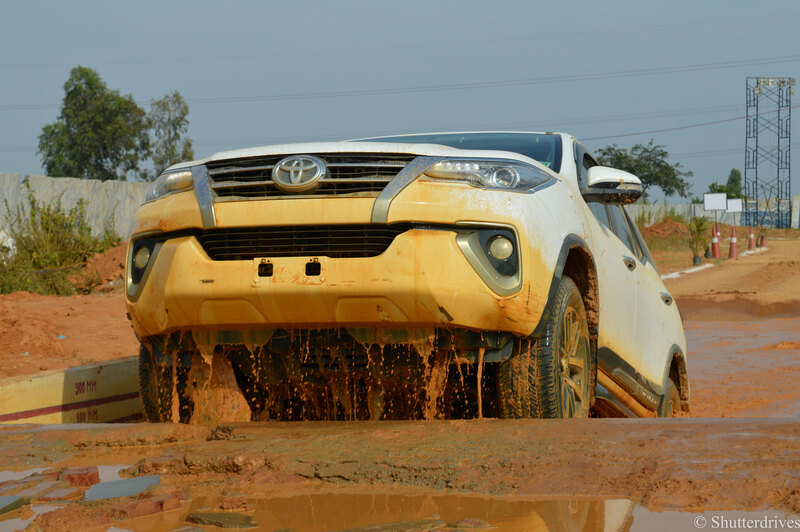 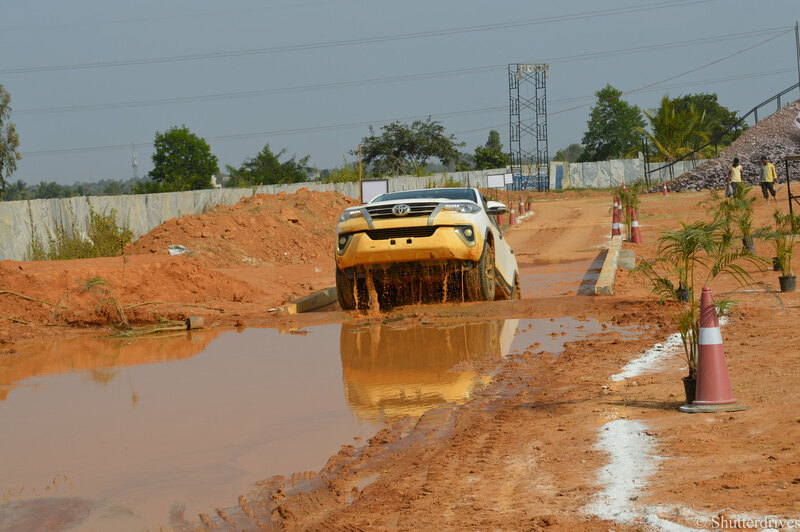 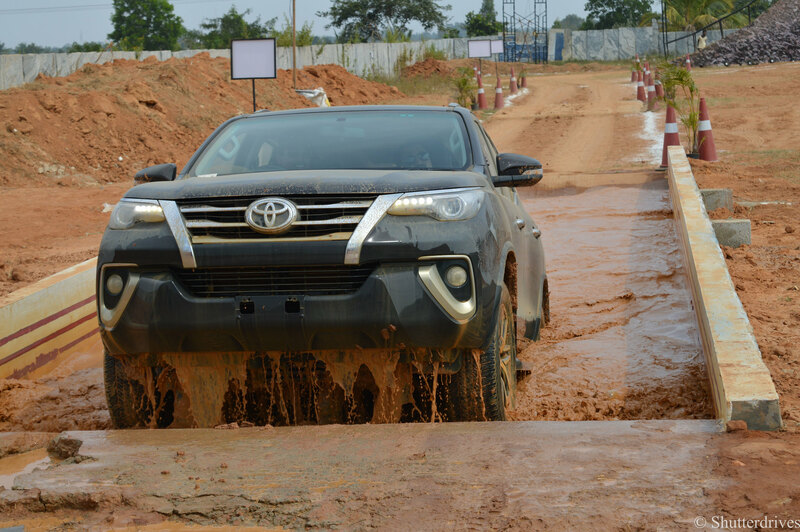 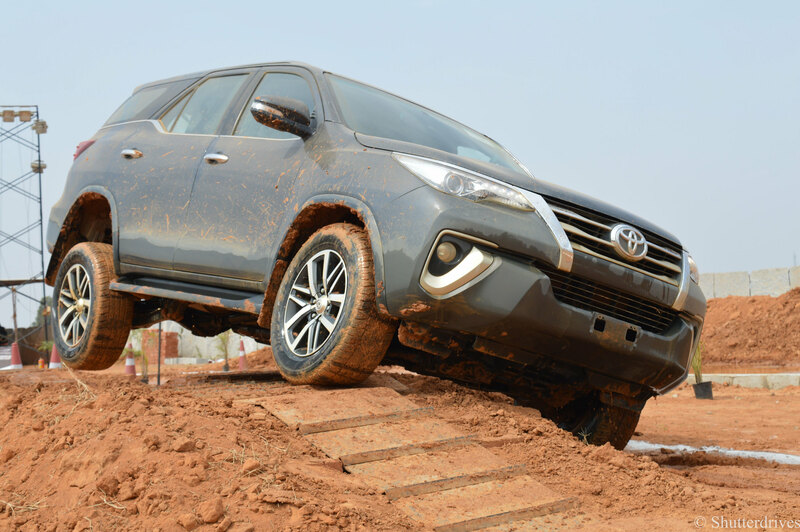 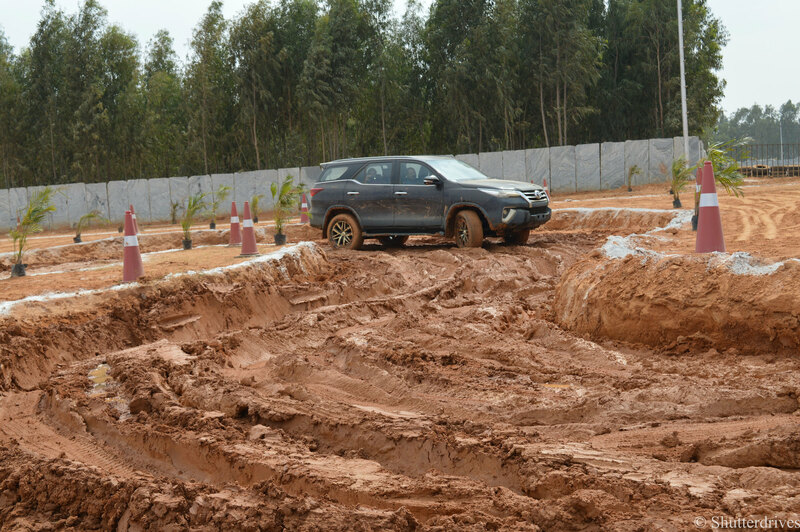 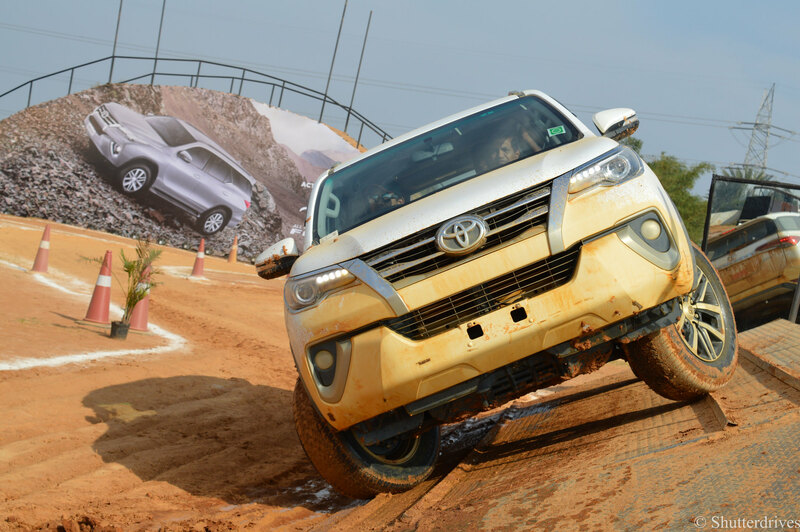 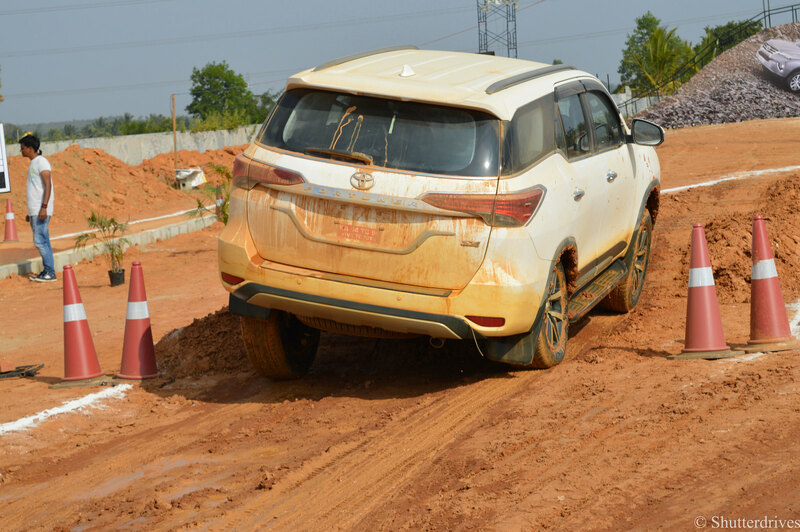 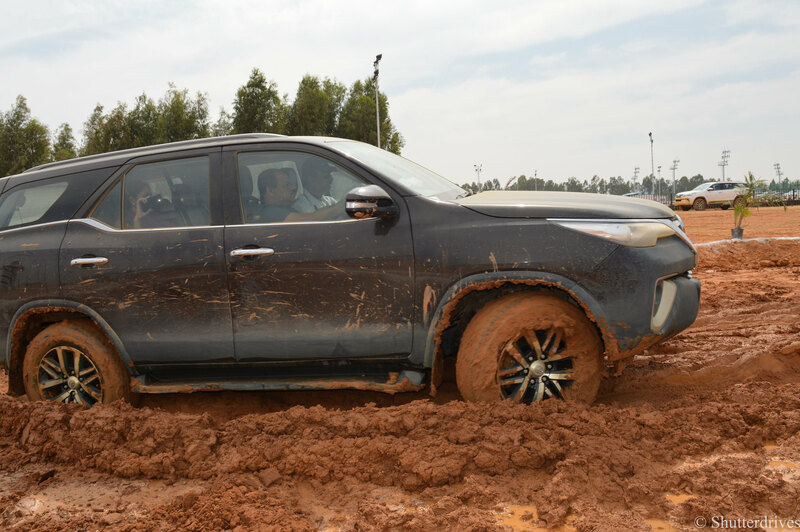 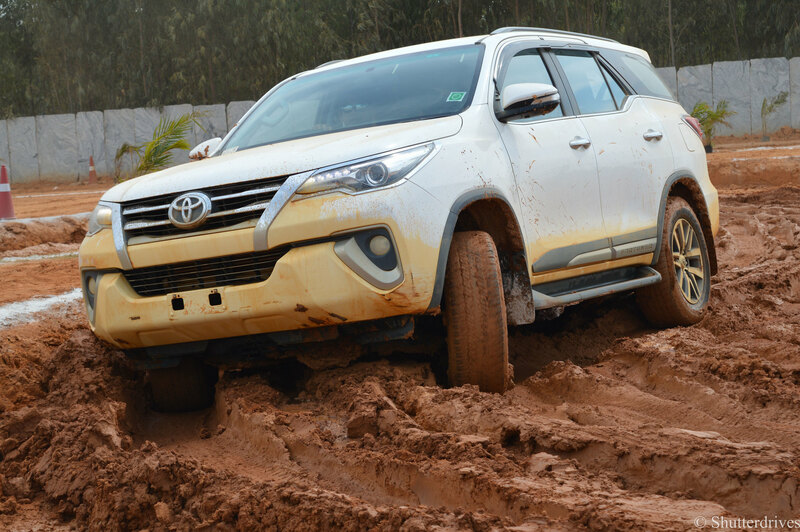 Toyota organized the “Fortuner boot camp” in the outskirts of Bangalore to experience the beast in its glory. 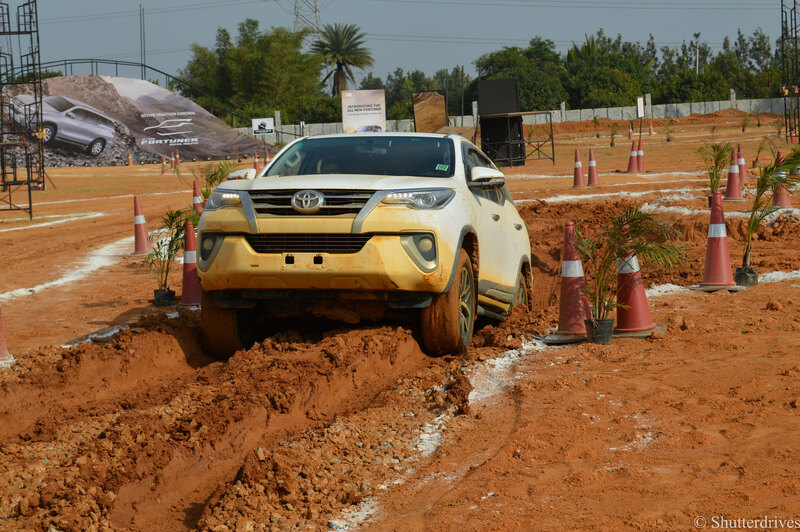 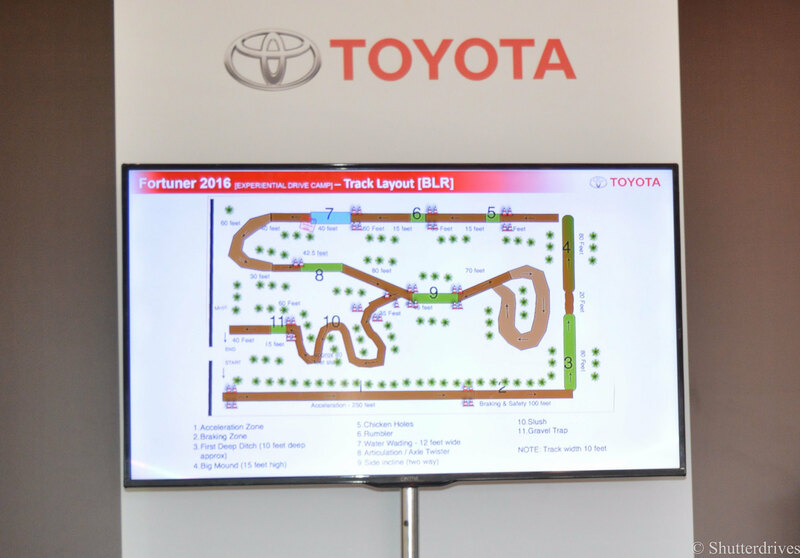 Demo round : Circuit tour by the off-road experienced crew. 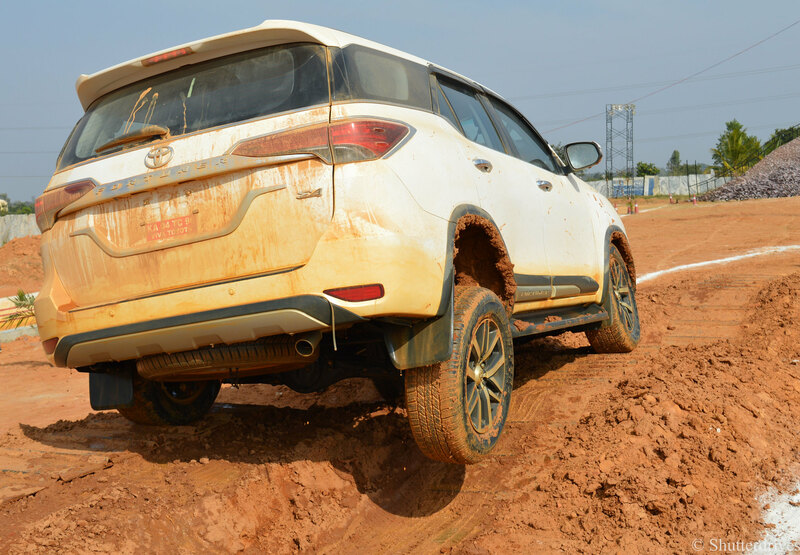 Attention to detail at its highest. 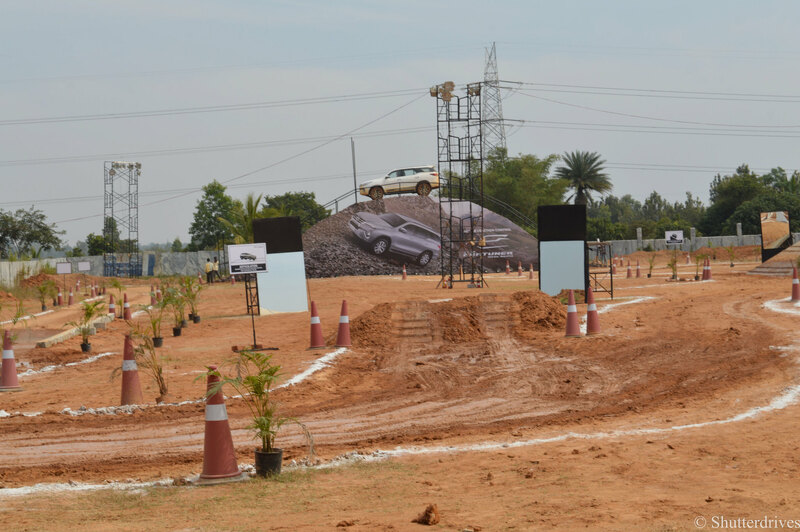 The participants are briefed about the track, vehicle, circuit and safety parameters. 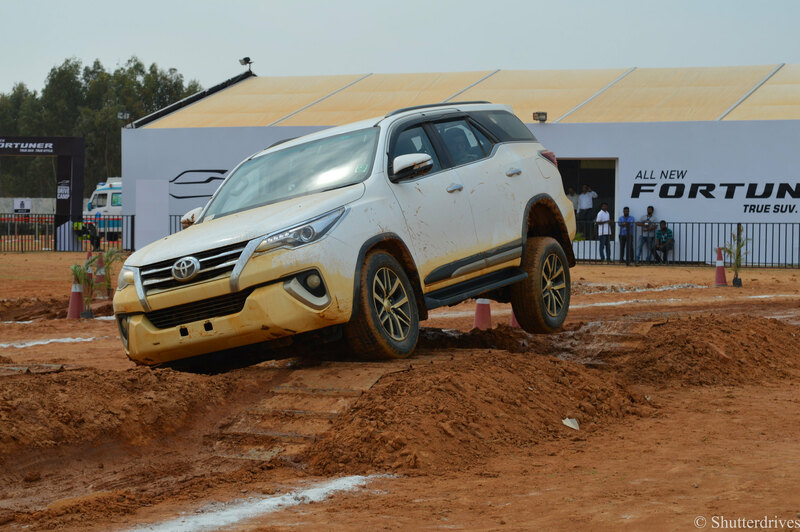 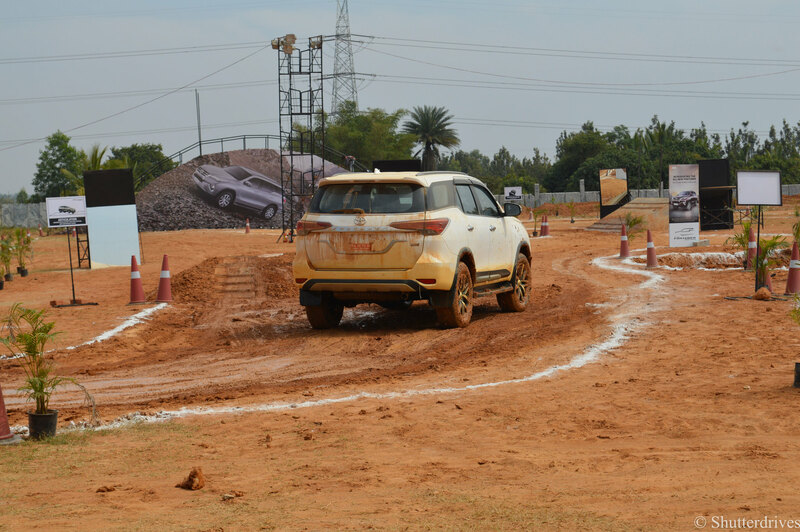 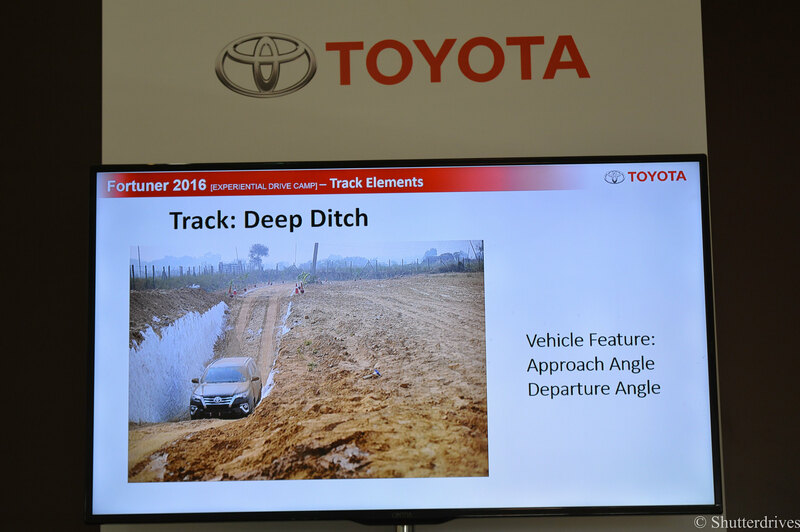 The objective of this obstacle was to keep a tab on the Approach and Departure angle of the fortuner. 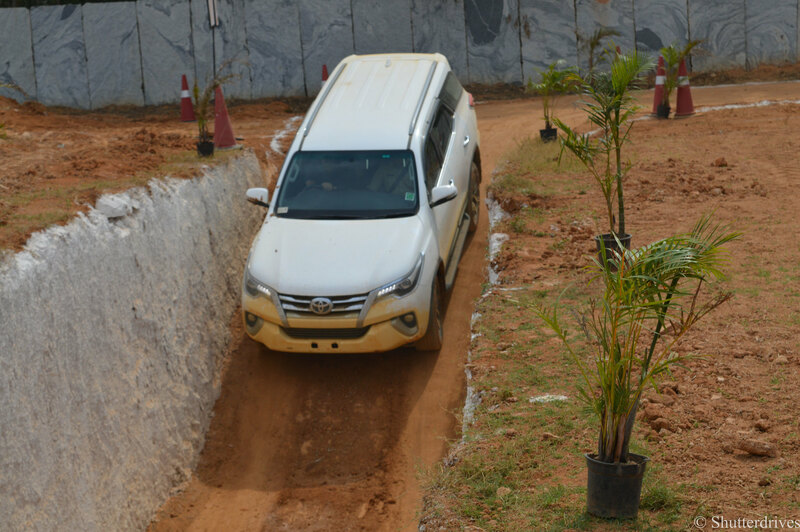 There wasn’t even a single moment when the car showed any signs of nervousness. 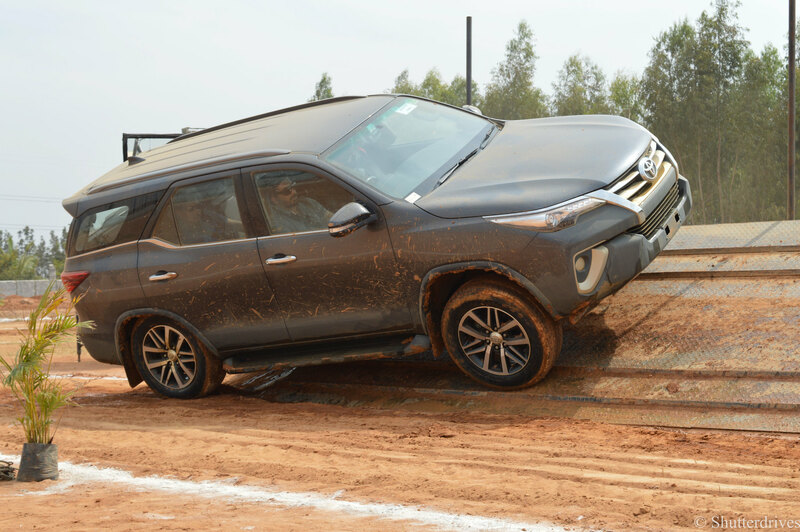 No under-body scrapping too. 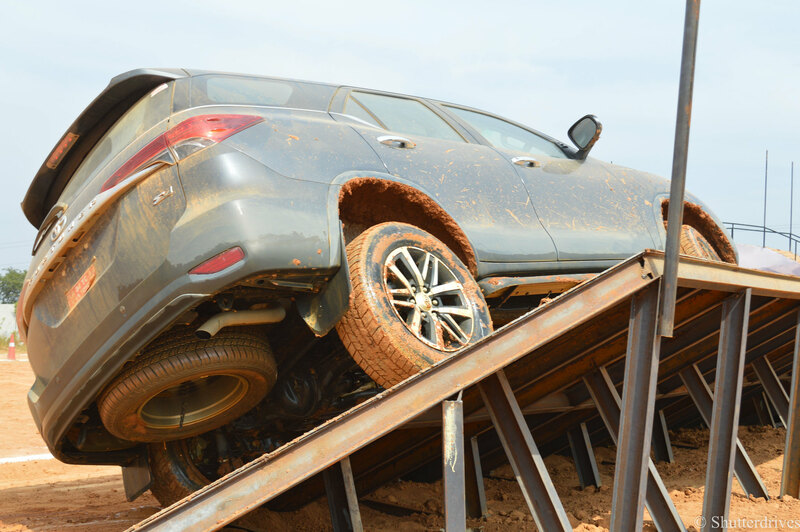 Walks away without a scratch. 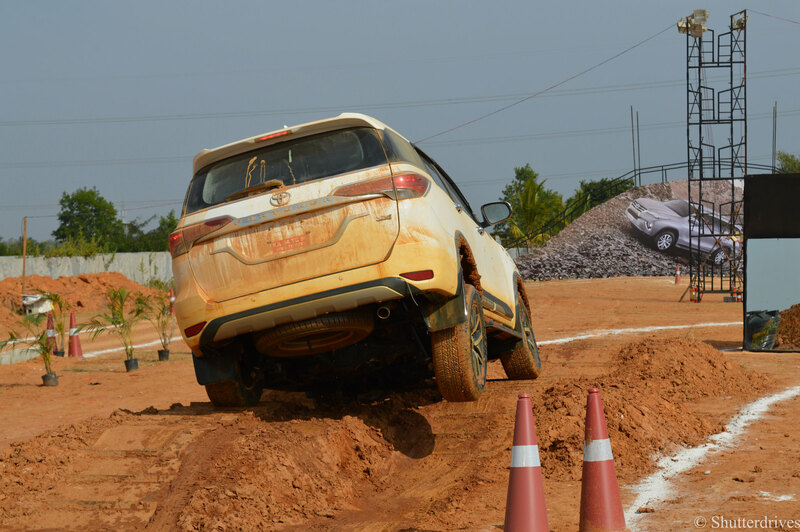 It was pretty scary to say the least. 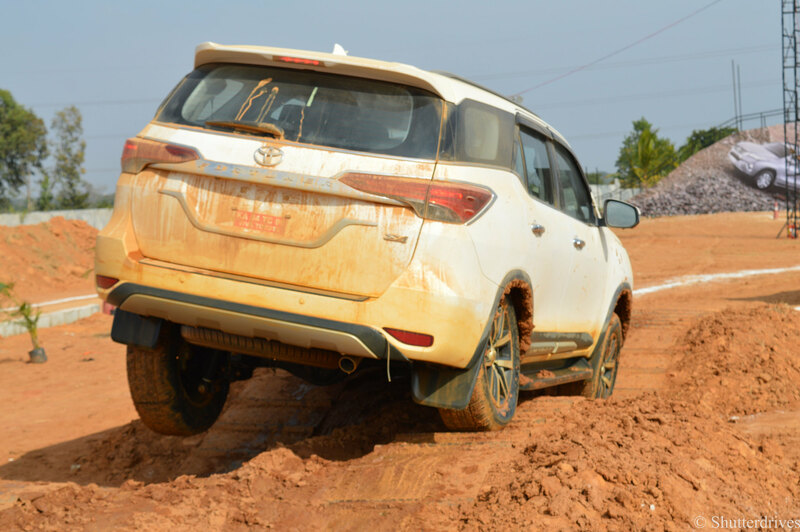 That moment when you have no idea of the path ahead of you and you blindly trust the fortuner and it doesn’t give any reason to complaint. 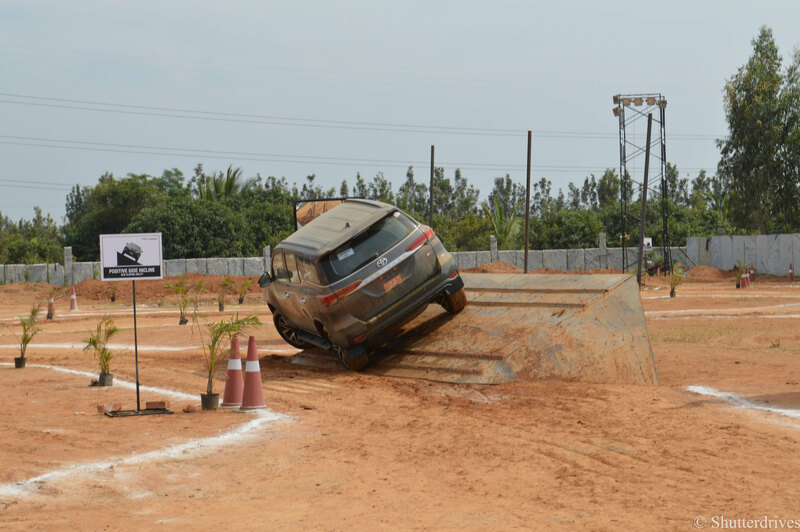 HHC holds the car for 3 seconds after releasing the foot from the brake pedal. 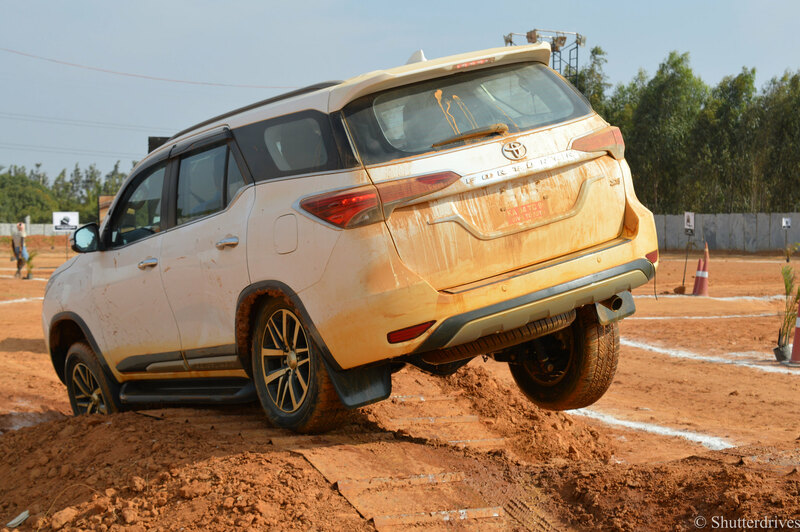 To Summarize, It defies the law of gravity for a moment. 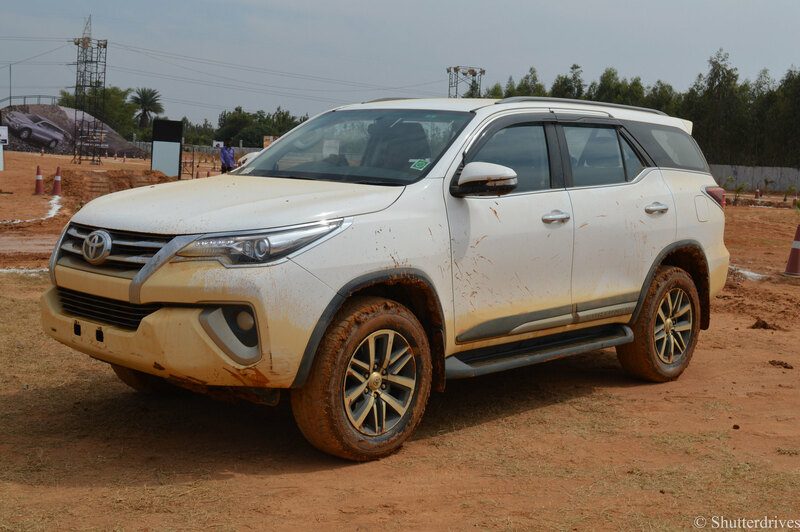 HDC is one of the most under-rated feature of modern cars. 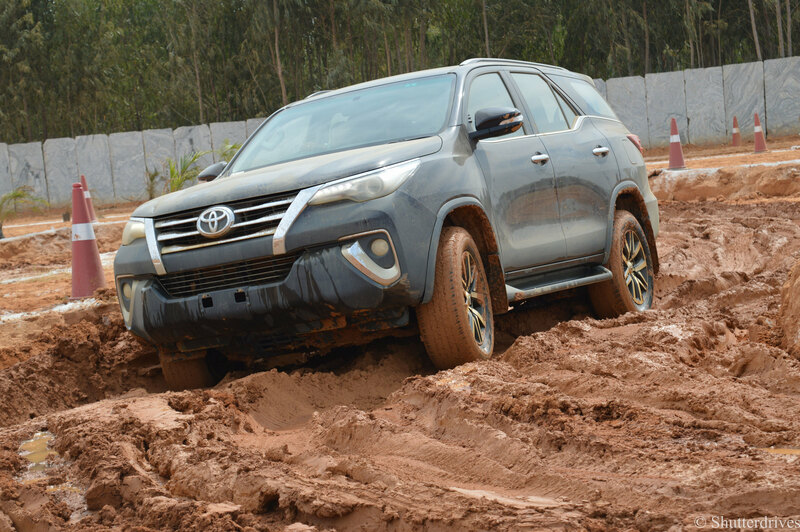 It is difficult to gain traction over the car when it is on a downward spree. 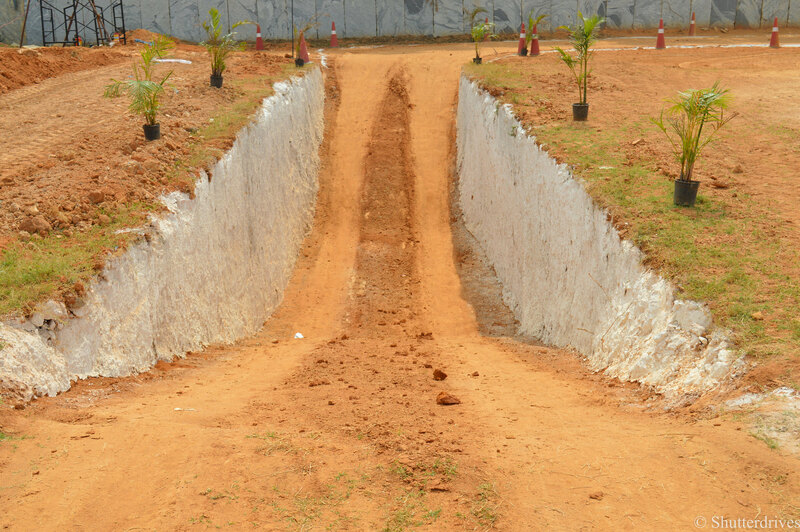 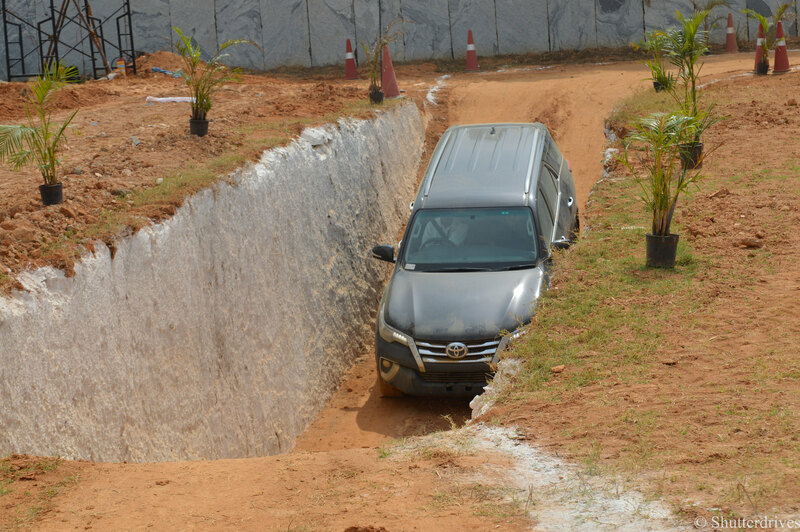 This is where the HDC comes into picture thus enabling the crawl to descend at very low speed. 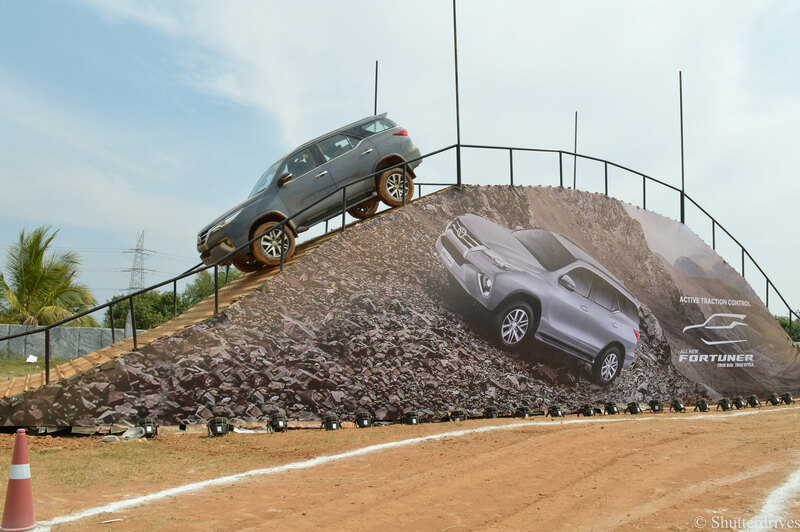 This was more like a roller coaster ride weighing over 2 tonnes. 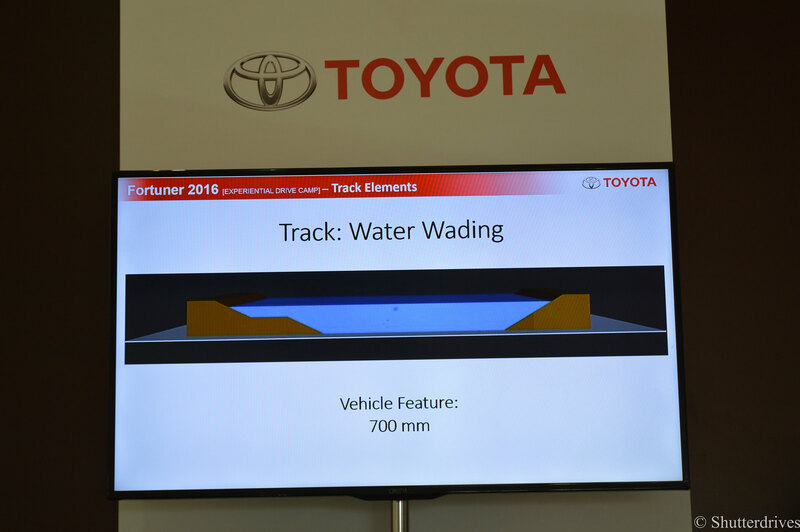 One of the key aspects in measuring the true potential of any off-road vehicle is the water wading depth. 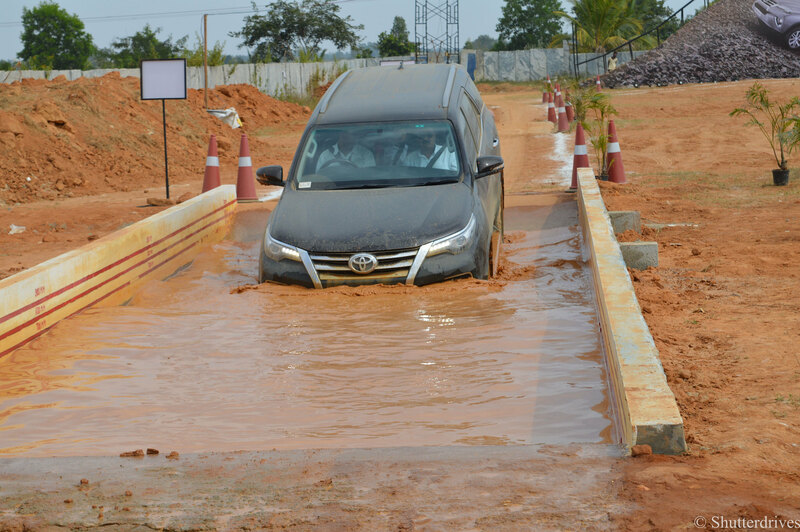 In another words it is how deep can the vehicle transverse through submerged in water. 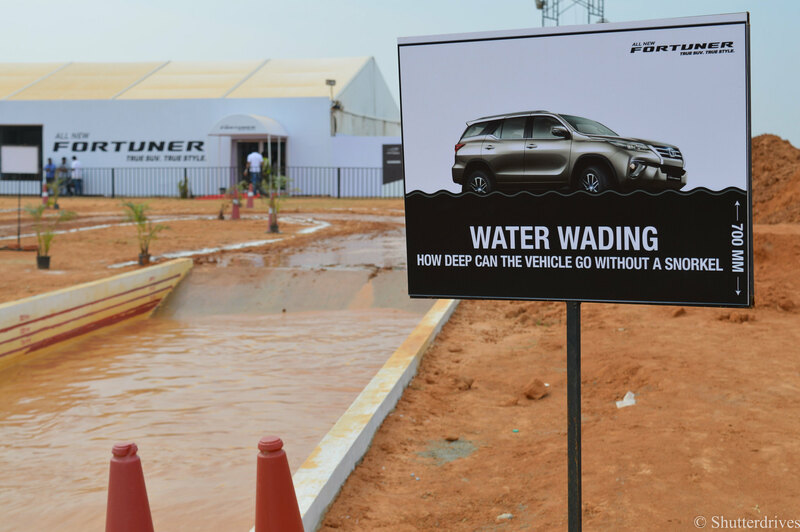 Fortuner has a water wading depth of 700 mm. 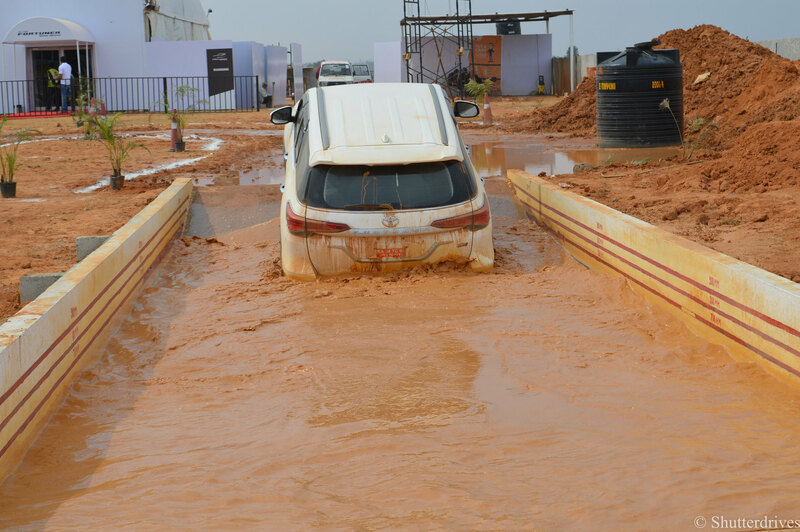 For reference, Range Rover sport has a water wading depth of 900 mm. 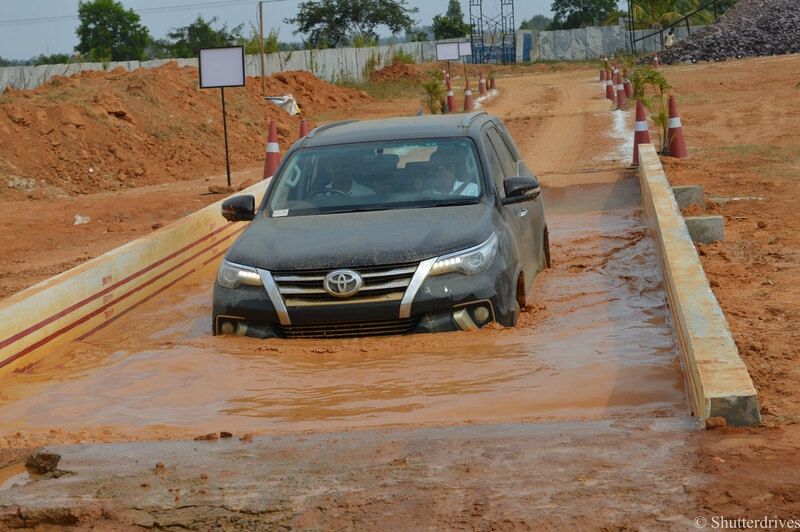 It is always advisable to mount a snorkel for air intake before taking the vehicle through water as it helps the vehicle in re-starting if its stalled in water. 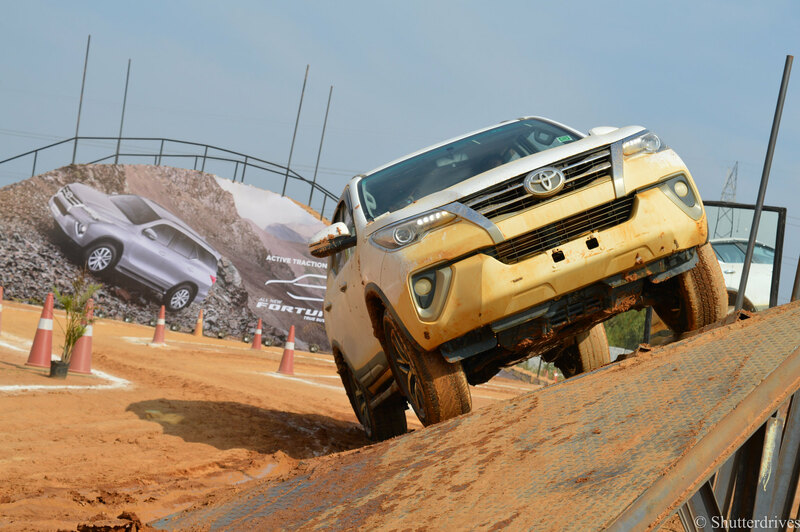 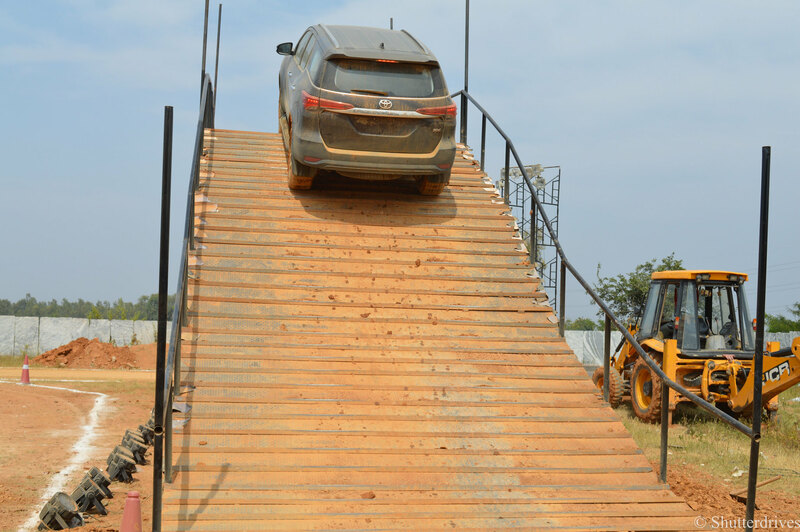 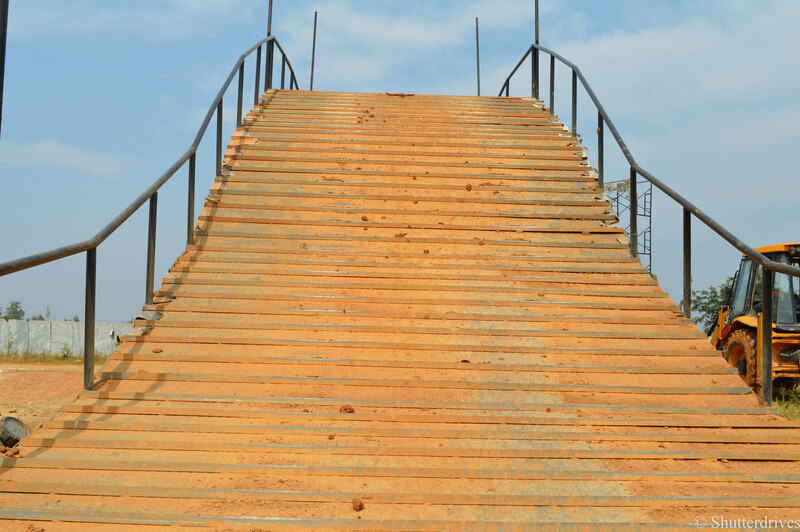 The objective of this obstacle was to focus on the suspension flexing of the fortuner. 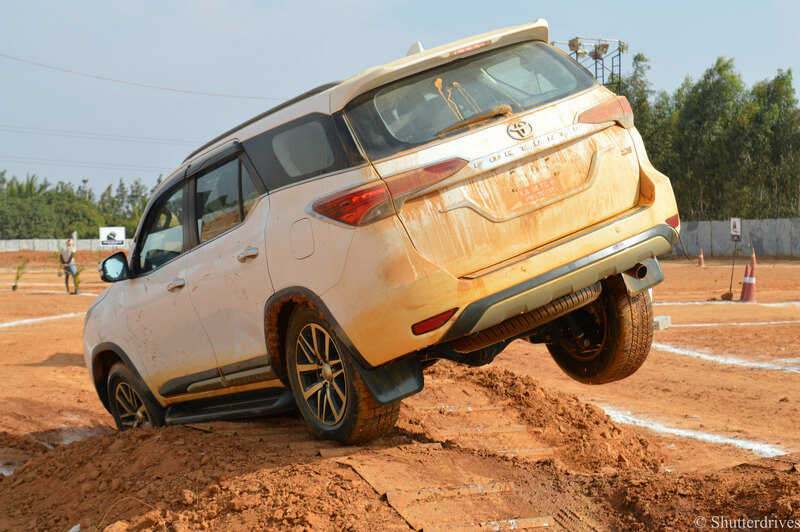 Equipped with double wishbone at the front and 4-link with coil springs at the rear, the ride quality of the new fortuner is leaps ahead over the previous one. 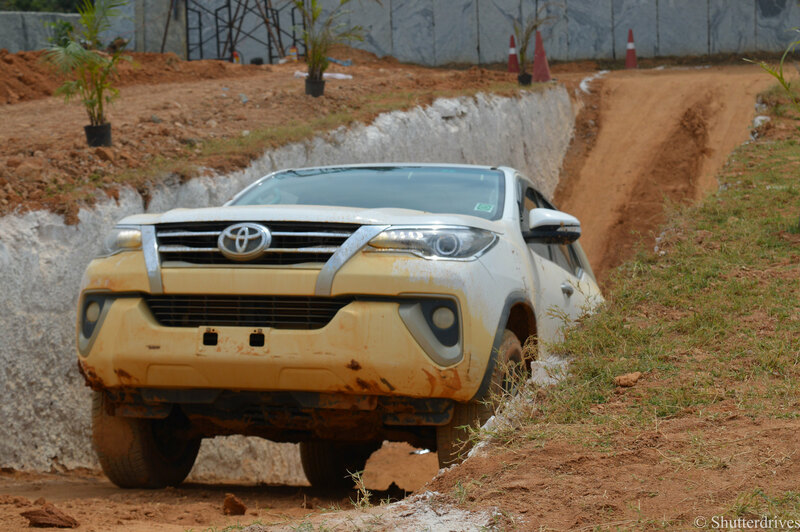 The track was brilliantly made for this obstacle in particular leading to some really interesting photography angles. 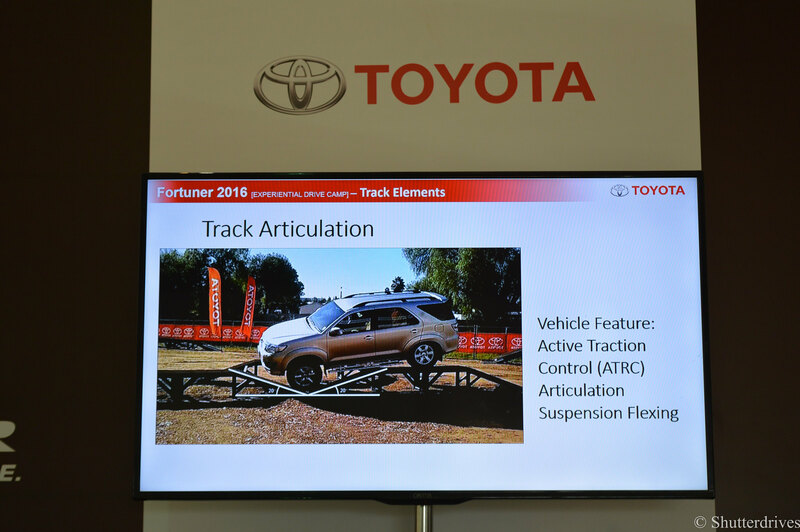 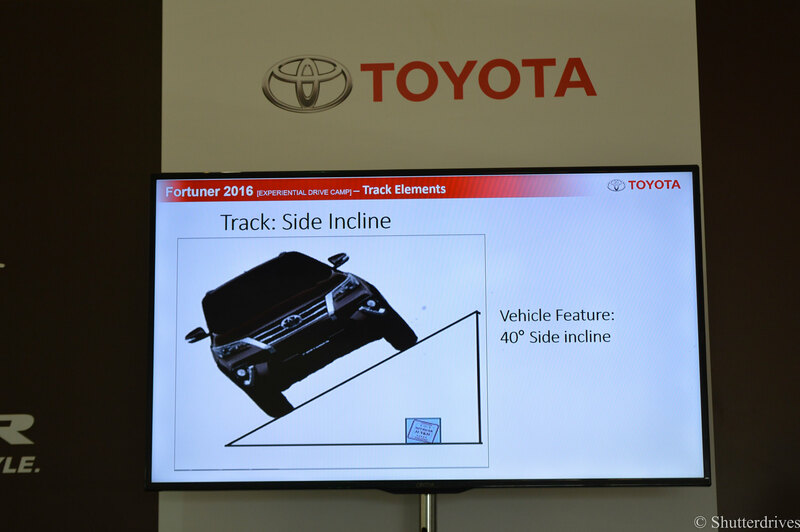 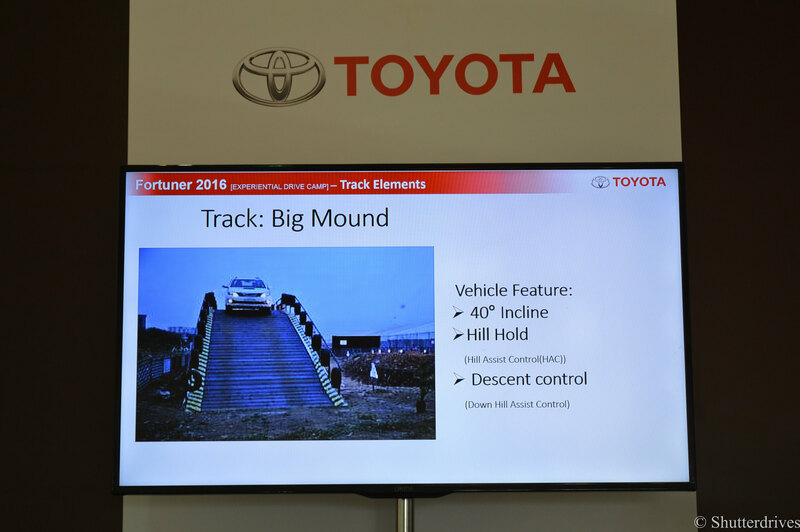 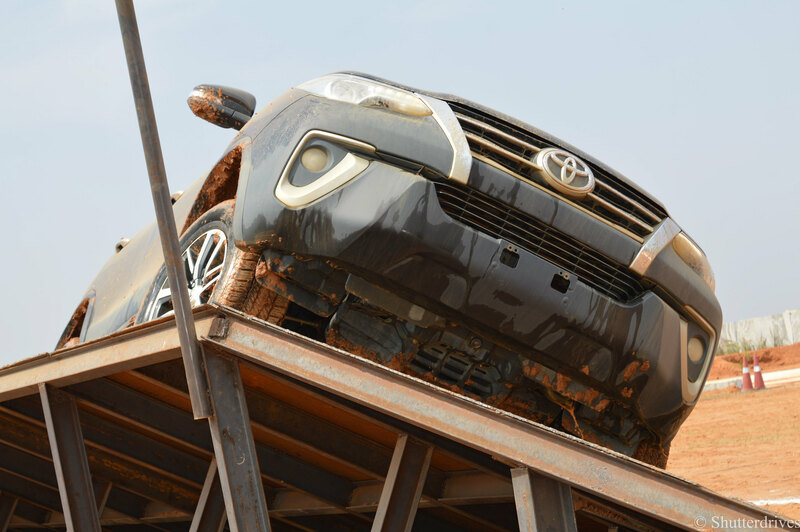 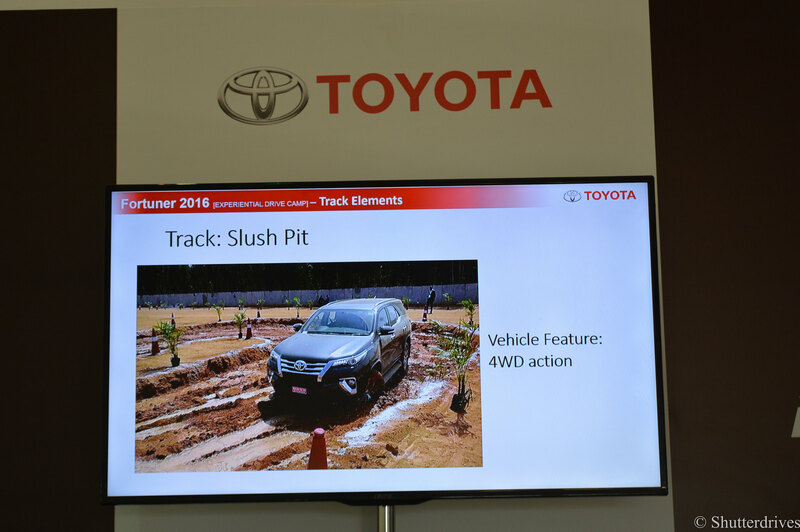 Fortuner was tilted at 40 degrees to assess the inclining capabilities of the vehicle. 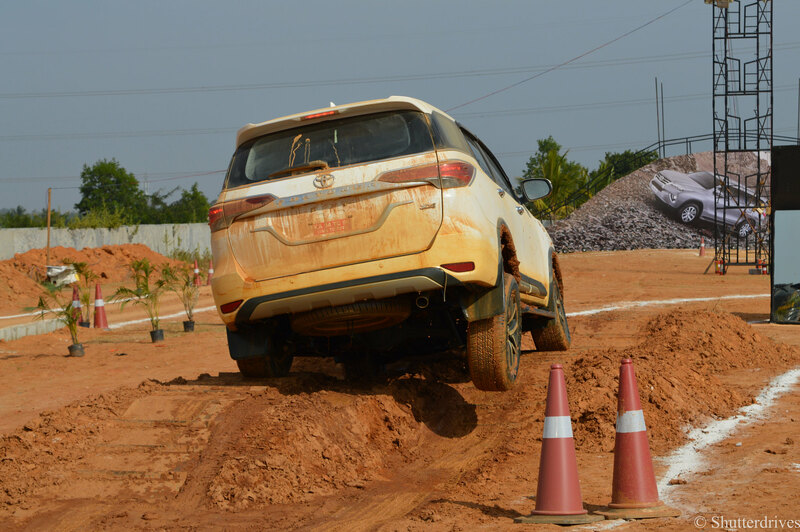 Not a sign of nervousness at any moment. 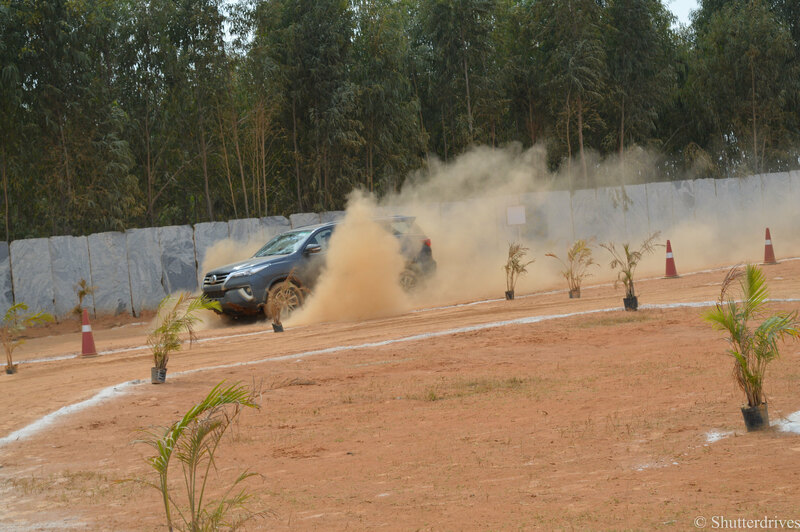 You tend to realize the importance of seat-belts here. 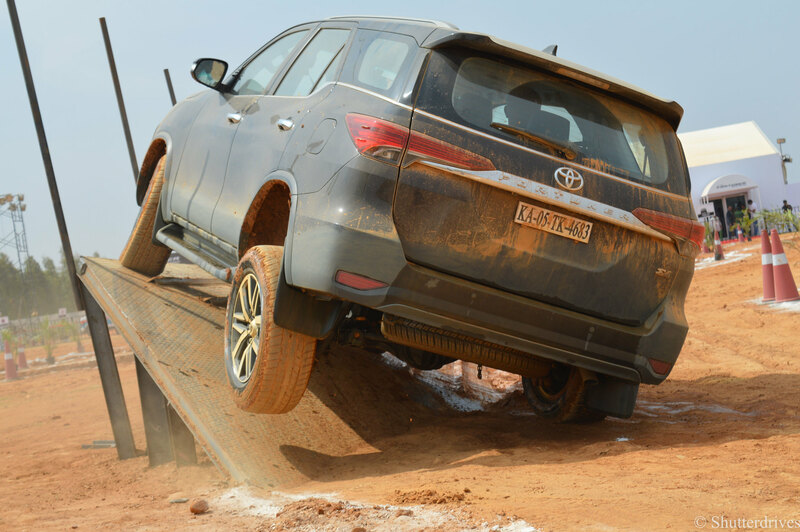 The suspension again provided excellent flexing to aid the fortuner to easily navigate across the side incline. 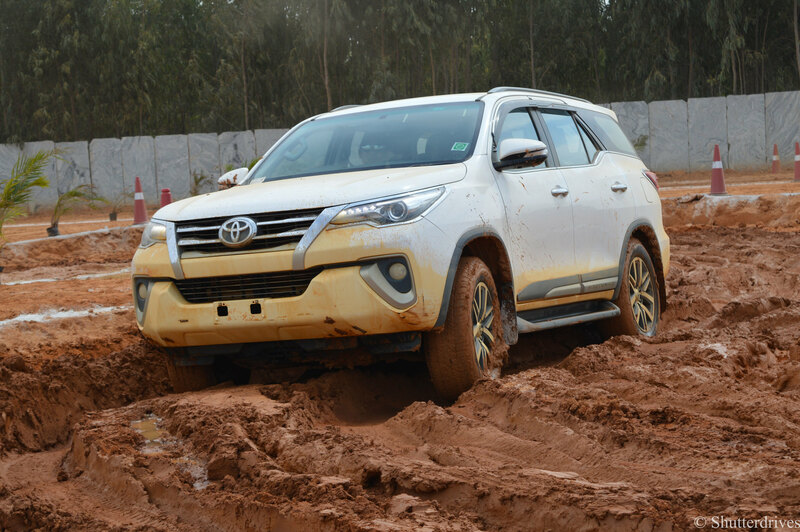 Slot the car in 4L (4 wheel drive low ratio) and the mammoth 450 Nm of torque helps the fortuner easily maneuver in the deep slush. 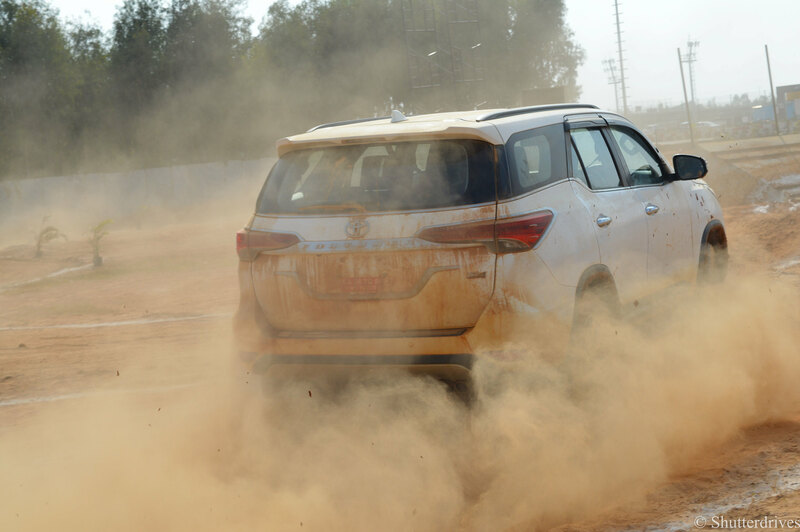 The throttle input needs to be precise as over-acceleration can lead to wheel spin and under-accelerating would not pump out the required power and torque to keep it going. 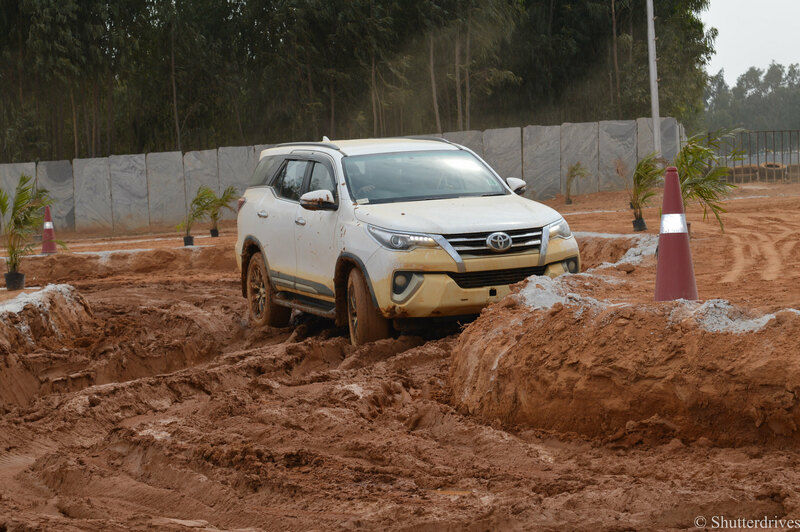 Overall, It was a great experience indeed to experience the beast in its glory. 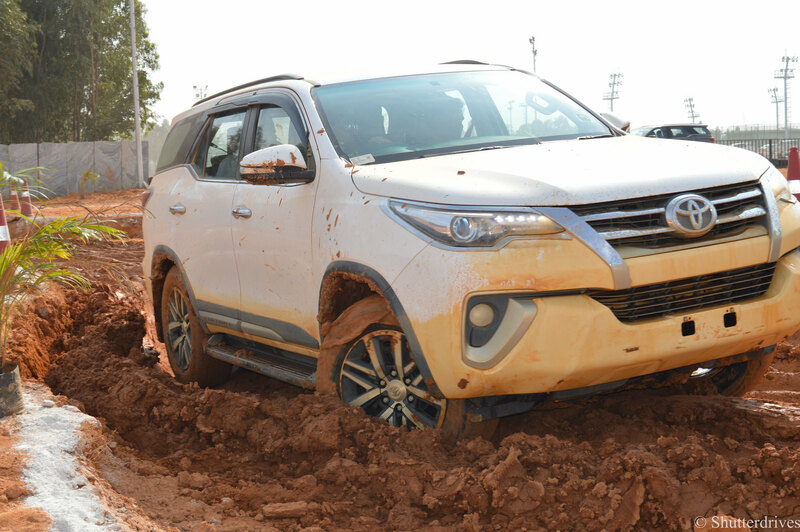 Would strongly recommend a 4×4 for anyone who is looking forward in getting the fortuner home because it will take you to places which a 4×2 can just dream of!